Old Faithful when it comes to comfort food recipes. It rained most of the week; Thursday I woke up to sunny skies and a stiff breeze. It felt like a meatloaf day so I hustled my bustle to ShopRite, a local grocery store, and bought ground beef (80/20 combo of lean/fat) and pulled out my trusty Betty Crocker Cookbook. 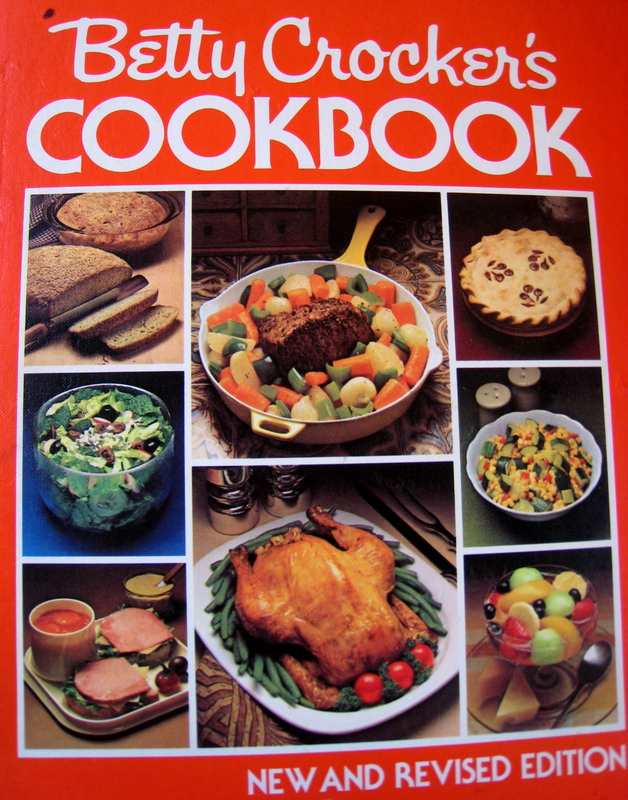 It’s the first cookbook I ever owned and I’ve used it a lot over the almost 30(!!) years Mike and I have been married. It’s my go-to recipe book for comfort food. My husband and kids love this recipe and so do I! My mother gave me her circa 1956 mixing bowl set a few years ago (I think she received it as a wedding gift) and it’s my favorite; the bowls nest together on my kitchen counter just waiting for me. I always make meatloaf using those brightly colored bowls. Do you gather all your ingredients first or do you run around getting them out as you cook? The bread cubes and milk went into the red bowl so the cubes had time to get absorbed by the milk before they got smushed into the ground beef. 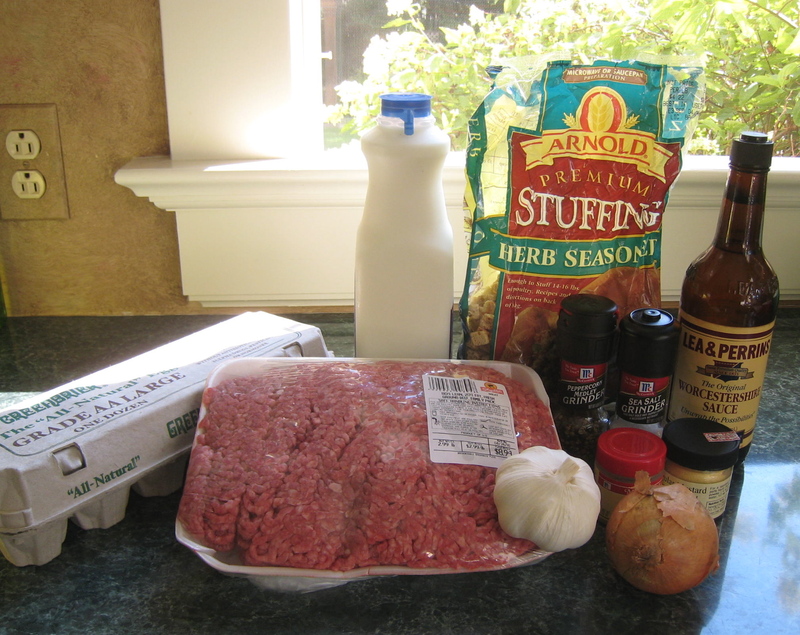 The ground beef went into the yellow bowl, then I chopped the garlic and onion and measured out the spices. Last of all I cracked two eggs (I doubled the recipe) into the blue bowl (to make sure they were okay looking and shell-less before I mixed them into the ground beef). Then came the fun part. . .the part my son Max does for me when he’s home. . .mixing all the ingredients together using clean, bare hands. Oosh that beef can be cold! 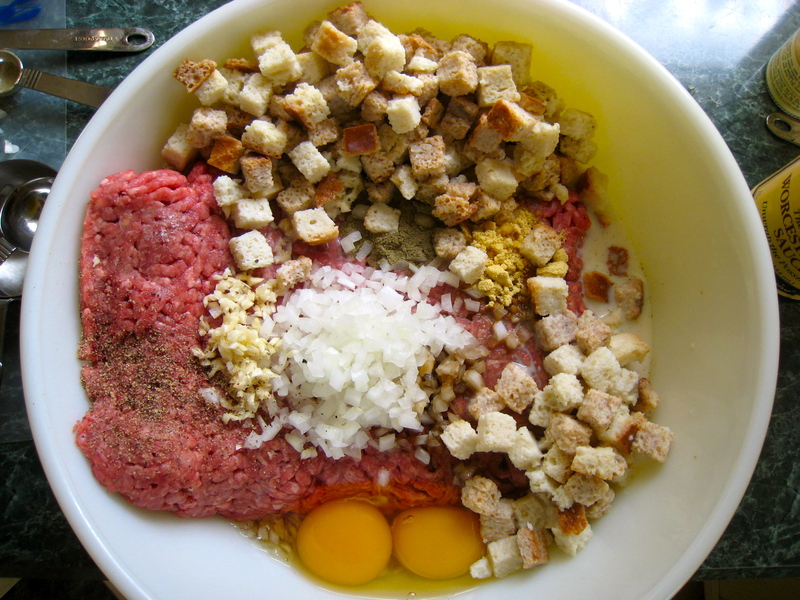 The big yellow bowl can handle a double batch of meatloaf. Since I doubled the recipe (it’s easy to do) I made two meatloaves and put one in a freezer for dinner another day. I love this kind of two-fer! 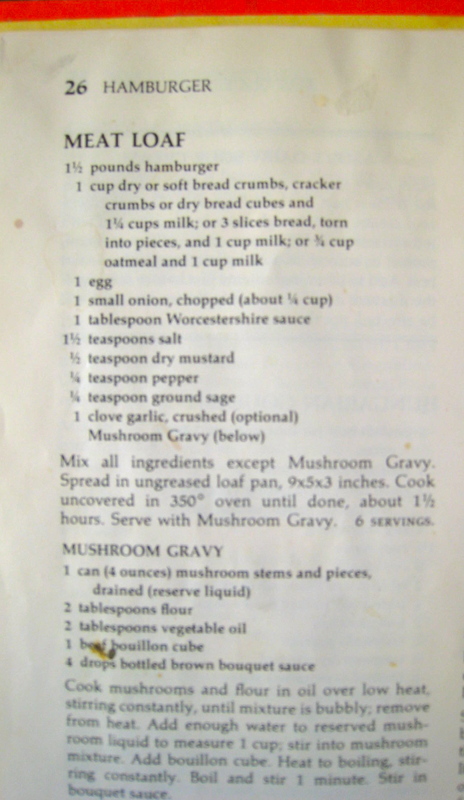 What did I make to accompany the meatloaf? Steamed new potatoes with garden parsley and a mixed lettuce salad. Yum!